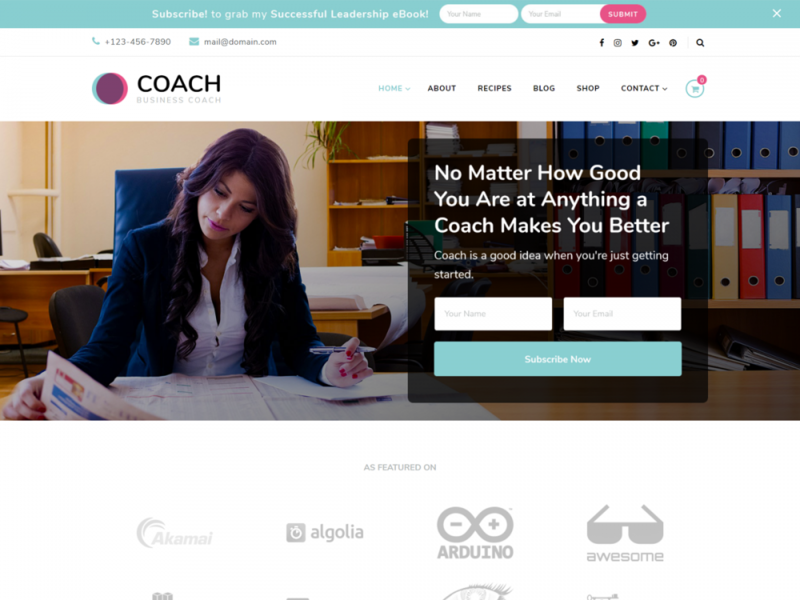 Blossom coach is a free WordPress coach theme designed to create websites for life coaches, health coaches, mentors, speakers and therapists. You can easily use this theme to create stunning website without any knowledge of coding. The theme is designed with features that highlights you and yours services that will help to improve your followings. Blossom Coach is optimized for smartphones. With more than 50% of Google searches being done on mobile phones, this fully-responsive feminine WordPress theme is designed to adapt to any screen sizes. Blossom Coach free WordPress theme passes Google mobile-friendly test. This means better rankings in search results and better user experience. It is also Schema friendly, which is an important ranking factor as per Google’s recent announcement. With Blossom Coach, you will always have an edge over your competitors. Let your visitors enjoy a smooth browsing experience. Blossom Coach is a speed optimized WordPress theme, which will load faster to ensure that you don’t risk losing your potential customer or new leads. To help you welcome new visitors to your website, the default Blossom Coach homepage layout features a large full-width slider/ banner section. You can use this section for a newsletter with static image/ video to display a greeting message, share photos, or improve your newsletter subscription. Blogs are a great way to attract new website visitors and built trust. Blossom Coach has three beautifully designed blog listing layouts. Let your visitors find you on social media and boost your business’ engagement. Blossom Coach theme allows you to display your social media links on your website and also supports Russian and Chinese social media like OK, VK, qq, Zing, and others. Add unlimited social media to your website! Blossom Coach gives an easy to use typography option that helps to change primary and secondary fonts of your website. Blossom Coach is fully compatible with BlossomThemes Email Newsletter plugin. You can easily add subscription form using the plugin. The theme’s newsletter section combined with the newsletter plugin will help you grow your email subscribers. Blossom Coach comes with a comprehensive documentation of the features and settings. The theme documentation is easy to understand even to the WordPress beginners. Your website can be set up in no time! Blossom Coach is WooCommerce Plugin ready. So you have got everything you need to start a powerful online store and sell all kinds of products for effective site monetization. Add and manage your widgets without compromising the design of your theme. Blossom Coach is optimized for widgets so that you can design, and customize your blog in a truly unique way. Tried and tested, Blossom Coach works seamlessly on the latest version of all the major web browsers including Chrome, Firefox, Safari, Internet Explorer, and Edge. Get maximum engagement from your visitors with Blossom Coach breadcrumb option, which enables people to navigate easily all across your website. Make sure that your visitors are treated with an awesome font type that is of legible size, spaces, and contrast. Blossom Coach optimizes the visual appeal of your content so that visitors enjoy what they are reading on the screen. Let there be no language barriers! Blossom Coach theme supports localization so you can translate the theme in your local language. Write your content the way you want! Blossom Coach heme supports right-to-left (RTL) scripts like Arabic along with LTR languages. Keep your website safe from vulnerabilities with our regular updates that keeps your site up to date with latest security and technical standards. We chose Blossom Coach theme for our page because it has great features and it is multilingual. Easy to set up and to configure. We had a little conflict between plugins and Blossom support was immediat, professional and effective. I can only recommend Blossom themes and their attention. Nice features & quick support! All the Blossom themes have very nice features even in their free version of the templates. I am using the coaching template and had one CSS change I wanted to make. The Blossom support team was super quick in responding with the answer. And, all for a free template. I will certainly use their themes again and will certainly pay for the Pro templates when my clients need them.